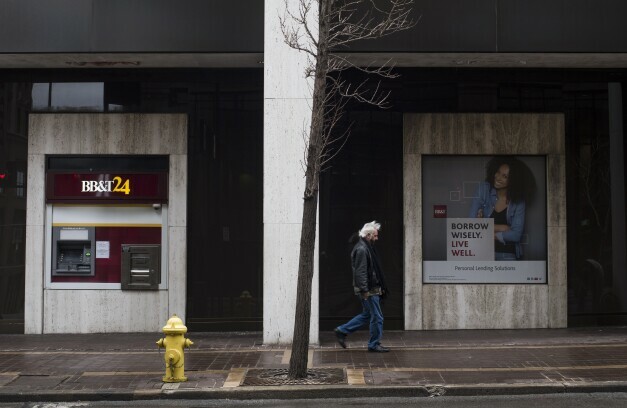 A pedestrian passes in front of a BB&T Corp. automated teller machine (ATM) in downtown Cincinnati, Ohio, U.S., on Wednesday, Jan. 10, 2018. Wachtell, Lipton, Rosen & Katz advised BB&T Corp in its $28.2 billion purchase of SunTrust Banks Inc, which was represented by Sullivan & Cromwell in the transaction. The deal will create the sixth largest U.S. bank holding company and has been widely described as the largest bank merger since the 2008 financial crisis. Shareholders of BB&T will own 57 percent of the combined company which will have a new name and a new headquarters in Charlotte, N.C. The merger announcement said that the boards of both companies unanimously approved the all-stock deal. Wachtell’s team was led by corporate partners Edward D. Herlihy and Matthew M. Guest. Herlihy is one of the country’s best-known banking lawyers and serves as co-chair of the firm’s executive committee. In a memo to clients last December, he noted that the U.S. Federal Reserve had undergone a “sea change” in the way it approaches objections from community groups to bank merger and expansion plans. A more relaxed regulatory environment makes it harder for community groups to block mergers on grounds that banks have not met federal requirements to serve communities. SunTrust’s banking practices were investigated several years ago, and it paid $968 million in 2014 after the Justice Department looked into allegations of improper mortgage originations and mortgage servicing and foreclosure abuses. Sullivan & Cromwell’s team representing SunTrust included the firm’s senior chairman and banking and M&A giant H. Rodgin Cohen, as well as partners Mitchell Eitel, Marc Treviño, Ronald E. Creamer Jr. and Joseph J. Matelis. The group also included one special counsel and five associates. The attorneys work in Sullivan & Cromwell’s corporate, financial services, tax, executive compensation and competition practices. The BB&T deal comes amid predictions that relaxed regulations and the accumulation of cash since the U.S. tax system was overhauled last year will spur financial institutions to merge. The deal appears to be the industry’s biggest since Bank of America’s $40.5 billion takeover of Merrill Lynch & Co. in January 2009.